Calgary Bay gave Henrietta Knight her second big winner in seven days when carrying a welter burden to victory in the Sky Bet Chase at Doncaster. The nine-year-old has reserved some of his best performances for Town Moor in the past and yet again he was seen to great effect as Dominic Elsworth gave him a patient ride, attempting to nurse him into the race with his big weight. Fruity O'Rooney led the field and still had every chance at the second-last when Jamie Moore's saddle slipped. That left Shakalakaboomboom in front, but Calgary Bay (12-1) soon swamped him and ran out a two-and-a-half-length winner. Moore performed miracles to cling on for third. Elsworth said: "I was really pleased with him and it's a fine weight-carrying performance. He's a really big horse and luckily he can carry it. It's not for me to say he should go for the National, but obviously he jumps very well." Knight added: "With that big weight he had to be patient with him. He likes it here and won his first chase on this track. "The Grand National is the aim. I think he'll go straight to Aintree now. 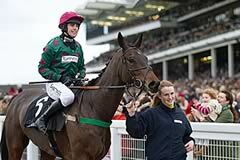 He deserves a rest now and he's been out in the field with Somersby most of the week. "We always wondered if he really stays three miles, but he has always loved this track and he was going to run in this race last year, but it was called off. I looked at all the last winners and nothing had won with that weight." Shakalakaboomboom is also to be trained for the National and his trainer Nicky Henderson said: "His rating of 144 could be enough. If he gave us another 2lb I wouldn't mind and what I would probably do is let him canter round in a novice hurdle. He's still a novice over hurdles. "He's run a very good race and Barry (Geraghty) said the ground was slow enough for him. Let's go and have a crack. He jumped beautifully in the Topham last year. He's good there and he stays. "He did everything right today except win. I just want to make sure he's safe to get in the race, but I don't really want to go to Cheltenham on the way."